Meal delivery services like Blue Apron and HelloFresh are all the rage these days. But if you’re looking for something a bit different, where you don’t even have to prep or “cook”, Tovala could be the perfect option. There are a number of food delivery services out there, but they mainly fall into two categories. There are services that ship pre-portioned ingredients with instructions for preparation, and other services that ship prepared meals (such as Freshly) you simply have to reheat. 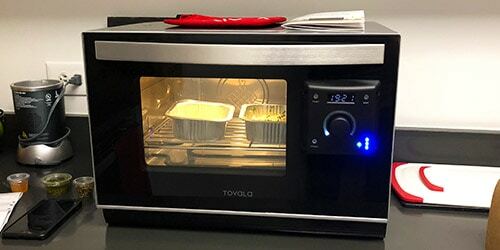 Tovala goes above and beyond the best of both worlds by not only shipping pre-portioned ingredients or complete meals, but automatically cooking them to perfection in their revolutionary, smart, wifi-connected Tovala Steam Oven in 20 minutes or less. What about allergens or special diets? How Does It Compare To Other Ovens? How Is The Freshness & Taste? How Do Tovala Meals Taste Once They’re Prepared? Is It Worth Buying A New Kitchen Appliance? To get started, visit the Tovala website. Simply fill out your name and shipping information to start. From there, you’ll be asked to enter payment information – you can pay by credit card or use their financing option (more about this in the Pricing section). From there, add any coupon codes or gift cards and submit your order! Here’s a link to try Tovala risk free for 180 days. That means they’ll give you a full refund within 180 days if you’re not happy with it (for any reason). This type of guarantee is virtually unheard of in the meal kit industry. They’re also currently running a promotion where you can get your first 3 meals free when you sign up for their newsletter. Score! Once you’ve submitted your order, you can expect your Tovala Steam Oven to arrive within 5 to 7 business days. Your first batch of meals will arrive shortly thereafter and all you have to do is place the dishes in the oven, scan the barcode, and start the timer. I found the lag between receiving the Tovala oven and the meals to actually be beneficial. It gave us enough time to get familiar with the oven, read the manual, and figure out where to place it in our kitchen. In addition to activating your subscription online, you should also download the Tovala app. You can use the app to manage your subscription (e.g. choose delivery options, pick your meals, pause/skip shipments). We’ll go into the full details of the app below. Tovala offers a variety of different meal options. You’ll notice in our selection, nothing is your ordinary run of the mill dinner. Upon reviewing their meals online, I found each to contains a great balance of macronutrients (protein, carbohydrates, and fat) to ensure that you feel full and satisfied but not overstuffed. We received their Nuoc Cham-Glazed Meatballs, Vegetable & Potato Chowder, and Tandoori Chicken Breast (which we made in the review video). These are not frozen meals. In fact, they’re quite the contrary. All Tovala meals are prepared at their facilities by culinary professionals and boxed up right before being sent out to you (the next day). Tovala offers both gluten-free and vegetarian meal options. The only downside is that they currently only offer two vegetarian meals per week but there are three weekly options for gluten-free meals. They do not offer keto or low-carb meals at this time, but all ingredients and allergens are listed on the package. Upon inspection of their meals, I found each meal ranges from 400 to 800 calories (which is also listed on the packaging). All of Tovala’s meals arrive in recyclable packaging. The trays themselves are 100% aluminum which can be recycled right along side your aluminum cans. The trays arrive in cardboard packaging which can be recycled along with other paper goods. You’ll need to make room in your fridge for the trays, but they are fairly compact. I’d estimate that they’re about 5 inches in height, 5 inches wide, and 7 inches deep. Each meal is packaged together with all of the necessary ingredients and some meals use more than one tray. If needed, you can separate the trays to store them, just make sure that you keep track of which tray belongs to which meal so you don’t forget. Each meal comes with a list of instructions and ingredients, however, so you’ll still be able to figure it out if you forget. When it comes to delivery options, you’ll select your weekly meals by Wednesday at 6pm for the following week. Depending where you live, your meals will arrive on Tuesday or Wednesday. Delivery is available throughout the contiguous U.S. Happy After Our First Tovala Meal — No Prep or Cleanup! 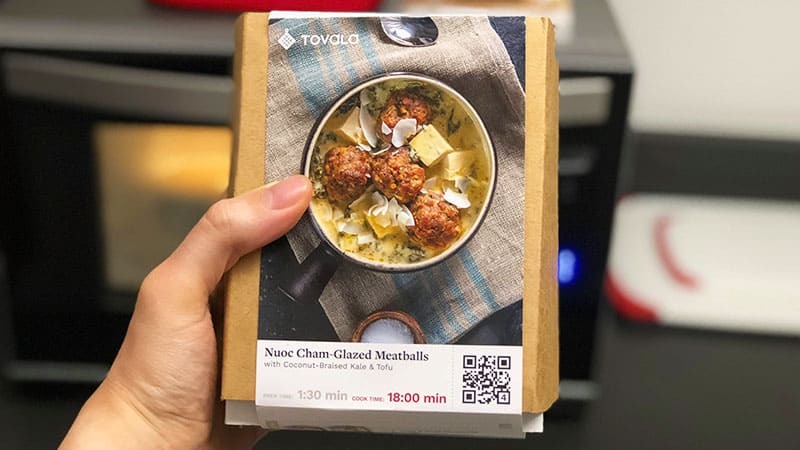 The first time you use your Tovala Steam Oven, you’ll have to do a little bit of setup, which the app walks you through, but I found that it’s smooth sailing once it’s ready to go. Start by unboxing the oven then download and set up the Tovala App (iOS and Android versions available) which will walk you through the rest of the process. You’ll need to place the oven rack in the oven, fill the water reservoir, and connect the oven to your Wi-Fi network. Each time you use the Tovala Steam Oven, you simply remove the plastic film from the trays and slide them into the oven. Make sure the water reservoir is full, then scan the code on the packaging and press the knob to activate the oven. It will automatically steam, bake, and broil the ingredients for the proper amount of time to provide you with a piping hot meal. Prepping the meals for cooking is very simple, almost nonexistent. In the review video you’ll notice we simply take the food out of the container and add the sauce. That’s it. You’re probably wondering what makes Tovala different when it comes to a smart oven? Why not just buy a smart oven and be done with it? First, Tovala is much more than just a smart oven. The oven goes hand-in-hand with their meal kit. Second, and more importantly, the Tovala oven isn’t an ordinary oven you’re probably familiar with. It’s a steam oven. That’s the reason you have to fill it with water to use it. A steam oven works much differently than a regular oven or even a microwave. Whereas a regular oven uses heat generated by metal coils or fire (if “broil” is selected) a steam oven simply uses… Steam. This may not sound like a big difference but it is. This is because the steam allows the food to cook while retaining all of it’s moisture and flavor. Steam also transfers the heat to the food much more evenly. On the flip side, the heat from a regular oven can pull moisture and flavor when cooking, as well as not cook as evenly/thoroughly. For example, when you put a cold dish in the microwave (or even a regular oven) to heat up, often times the outside of the food gets very hot while the middle is still cold. Often times I find meal kit apps to be secondary to their website. I often skip using them and control the entire ordering process right from the website admin page. However, the Tovala app is not just useful, it’s mandatory. At first I was skeptical that it would work. Surprisingly, setting up the oven with the app was a breeze. All you have to do is ensure that it’s on the same wifi network and they can “talk” to each other. One of the coolest aspects of the app is that it has a built in chat feature. So if you get stuck at any point in the setup process or if you have a question after it’s setup, you can simply chat with their customer service right in the app! This is a huge plus in my book because getting in touch with customer service with some other meal kit companies has been a hassle in the past. Once the app is all setup, you’ll notice that it’s the main way you control the oven. You literally use it to set the time, temperate, and even add additional steps to the cooking process. From my experience using the Tovala oven, controlling it from the app felt like I was living in the future. As mentioned above, you also control your meal plan subscription from the app. Going on vacation and need to pause your meals? A few taps and you’re all set. 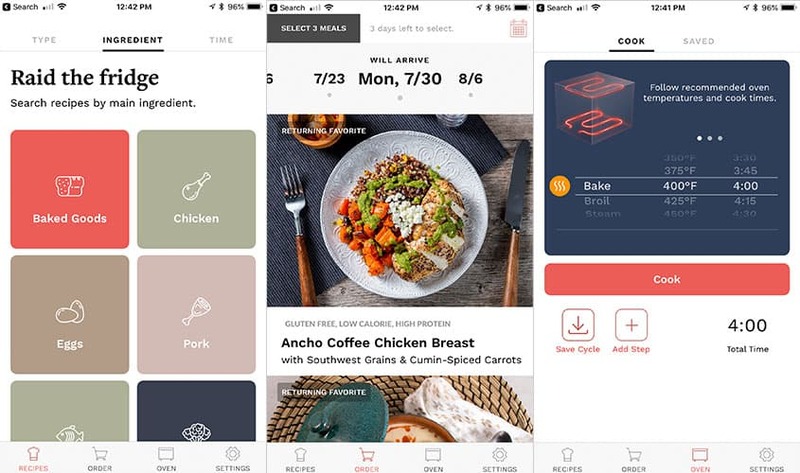 They also give you the ability to view upcoming meals so you can see which you want to pick based on ingredients, nutritional information, and even cook time. Tovala uses, what they call, “clean ingredients” – that means fresh, natural ingredients that arrive raw but already prepped. Everything is cooked fresh, in your Tovala oven, so you aren’t reheating meals that have already been cooked days before. All meats are free from antibiotics and hormones, and all ingredients and allergens are listed on the packaging. Not only are Tovala’s ingredients guaranteed fresh, but they are delivered in stay-cool packaging to maintain that freshness. Meals are delivered on Tuesday or Wednesday each week and will remain cold and fresh in their packaging until midnight, just in case you aren’t home when they arrive. When you get home, simply open the box and transfer the containers to the refrigerator where they will remain fresh for up to five days. Most of the meals that they send are well-balanced. You’ll receive a protein of some sort, side dish, and vegetables. The protein is often a chicken, beef, or fish. However, you’re likely to find tofu offered on their meal plans too — a great option for vegetarians and vegans. 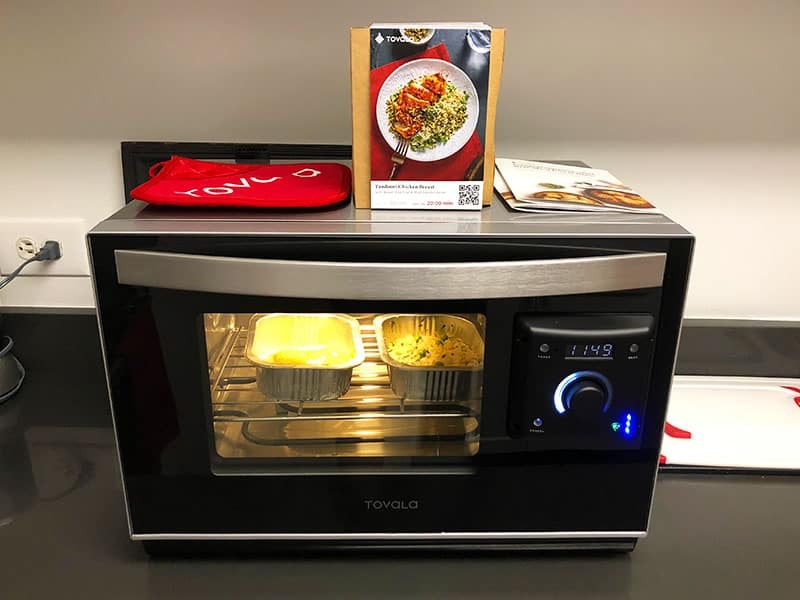 Upon receiving our first Tovala meals, my first thought was, “This is either going to go really good or really bad.” My skepticism was based upon the fact that I felt like I was letting a robot or an algorithm cook the meal for me. Technically, I was. After scanning the QR code and popping the Tandoori Chicken Breast with Rice in the oven, I sat back and let it cook. 20 minutes later, it was ready to eat. The final results? Amazing. What I originally though was going to merely be a reheated meal in a fancy microwave turned out to be a restaurant quality meal with (almost) zero prep or clean up. We specifically made the Tandoori Chicken Breast with Rice because both chicken and rice are easy to over or undercook. When overcooked, it can turn out to be a very dry meal. Yuck… However, the steam oven ended up cooking it to perfection. While watching the oven cook our meal was a magical experience, after it was done I could also definitely tell by the juiciness and flavor that these meals are made with fresh ingredients. When it comes to pricing, the thing you need to know about Tovala is that you aren’t just paying for your meals. This service requires an upfront investment of $299 to purchase the Tovala Steam Oven but there is no additional charge to use the Tovala iOS or Android app. Plus, with financing options, you can divide this upfront cost into 3, 6, or 12 monthly payments at 0% APR for 12 months. A nice added bonus for those who can’t afford to drop hundreds right now. The Tovala oven is priced slightly higher than what you’d see a comparable steam oven, such as the Cuisinart CSO-300N, priced at around $230. However, Tovala is one of the only smart steam ovens on the market right now. That means you’re not just getting the oven when you purchase, you’re also getting access to their app, which has a whole host of different functions — from controlling the oven to finding unique recipes, and of course, cooking the Tovala meals as simply as pressing a few buttons. 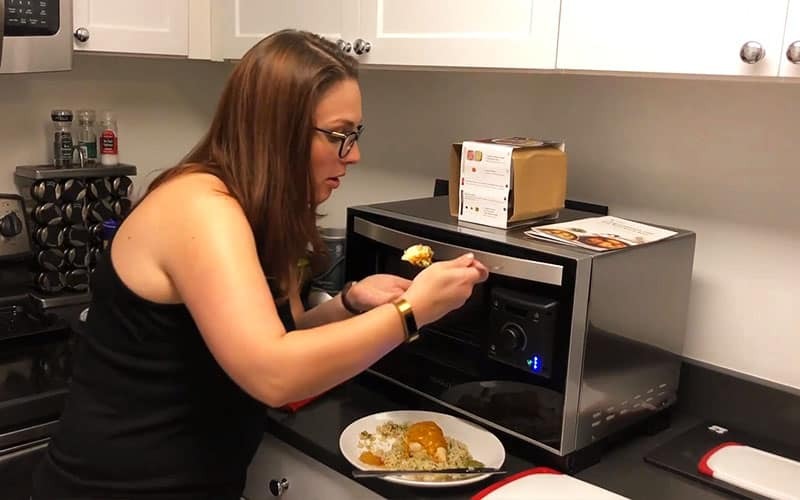 If you’re still a little skeptical about buying a new appliance, know that it can be used for plenty of applications other than Tovala meals. The Tovala Steam Oven can steam, bake, broil, or toast which means that you can prepare homemade recipes in the oven as well. We tested making a regular (non-Tovala) meal in the Tovala oven using each of the presets. They all worked well. Be advised that cooking regular meals is a bit different using the Tovala steam oven. First, you’re using steam instead of regular old heat. Second, it’s a smaller oven size. We accidentally underestimated one meal and had to cook it in two batches because it couldn’t all fit in the Tovala oven. Lastly, remember that you have to use the app to control everything. This requires a little getting used to. The first few uses cooking our own meals with the Tovala oven, there was a small learning curve. Tovala meals are entirely made from scratch by culinary pros and delivered right to your door, ready to cook. You have the option to choose from 3 to 6 meals per week, with 1 or 2 servings per meal. Each serving costs $12 so, if you choose 3 single-serving meals per week your weekly cost is only $36. If you want two servings of each meal, you’ll pay $72 per week. Billing is automatic, so once you sign up you never have to worry about making payments. You’ll be billed every Wednesday at 6pm as long as your plan is active. If you want to skip a week or customize your delivery schedule, you can do that as well, on the app. You can pause, skip a week, or cancel your plan at any time with no fees. If you aren’t fully satisfied you can return the oven for a full refund within 180 days of purchase. 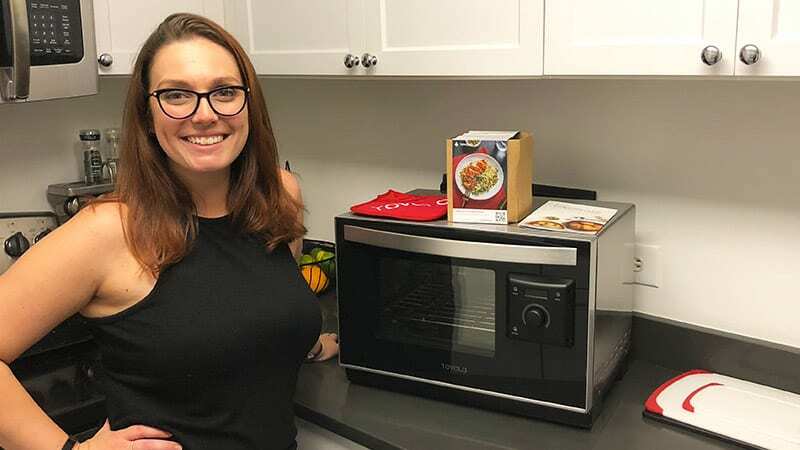 You may be asking yourself, “How do Tovala meals stack up to other meal kits?” Answering that question is a bit tricky. The meals we cooked with Tovala are, without a doubt, some of the best we’ve cooked, eaten, and reviewed on this site. However, they don’t necessarily fall into any other traditional “meal kit” categories. Tovala isn’t like Blue Apron or HelloFresh where they a box of ingredients and you cook the meal. Nor are they like Freshly, where you receive a pre-cooked meal that simply needs to be reheated. It’s more of a hybrid between the two where the meals are 99% prepped and you just need to cook them in the smart steam oven. Since the meals come prepped already and they use high-quality ingredients, you’re going to be paying more per-serving than traditional meal kits. As mentioned above, each serving of a Tovala meal is $12. This is about $2 to $4 more per serving than you usually see from the “big” meal kits. The future of cooking is not going to be going to the grocery store, picking out ingredients, prepping, and cooking. It’s going to be as simple as scanning a QR code and waiting for a robot to cook it (perfectly, might I add) for you. Many have tried and failed at revolutionizing the way we cook. Just look at how many meal delivery companies have tanked in the past decade. While some may scoff at the cooking industry being “disrupted” by advances in technology, there are many others like me that believe it’ll be commonplace much sooner than expected. I believe Tovala is the first step in a giant leap towards the at-home cooking revolution. Tovala, as a steam oven, performed much better than I expected. It cooked the Tovala meals quickly and thoroughly. Even as a standalone steam oven, it cooked well. My only gripe is the size of the oven. We live in an apartment where out kitchen isn’t the biggest. That means counter space is something we take very seriously. Weighing in at 33 pounds, the Tovala oven itself is 14 inches in height, 19.75 inches wide, and 17 inches deep. It’s not huge but it takes up a bit more room than your average microwave would. That being said, it does the job of an oven, microwave, and toaster. As mentioned above, Tovala comes with a 180-day trial. So even if you change your mind, you can return it — no questions asked. I’m thoroughly impressed with the fact that they offer this type of guarantee. Even with that, they offer a 2 year warranty on the oven so you don’t have to worry about it breaking. The main benefit of Tovala is, without a doubt, it is extremely convenient. I would go as far as saying that Tovala is like having a private chef in your kitchen all the time. Not only does it save you the hassle of grocery shopping each and every week, but there is nearly zero prep work or cleanup involved. Have you tried Tovala? Have a question about their service? Leave your question/comment below and we’ll get back to you as soon as possible! I enjoyed reading your posts about meal delivery services. My issue is We are a family of 4 (hubby and19 year old twins). We are all overweight, busy, and when I get home after a long day of teaching, I’m too tired to prepare and cook meals. We use Shipt and that has helped save time. Is there a meal prep delivery service out there that won’t break the bank to feed a family of 4? And taste good of course! Hey Lisa! Thanks for your message. I definitely recommend checking out Dinnerly. They’re one of the most inexpensive meal delivery services out there that allow you to also have healthy (and tasty) options :). We will definitely put out more of these types of reviews! Hi Shelly! You can use the Tovala Oven for all your own meals as well! Learn more here: tovala.com. We also launched a new version of the oven in November 2018.